When Ashleigh decides to flee her controlling husband, Dominic, she knows he’ll hunt her down. The only way to escape is to disappear and reinvent herself. With its fast-moving plot and nail-biting suspense, Indigo Storm is the story of a courageous woman fiercely determined to reclaim her life and her belief in herself. 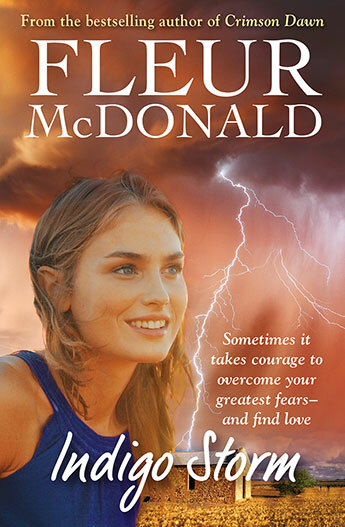 This was my introduction to Fleur McDonald, a very successful Australian author with already six books published, and an established reputation in Australian rural literary fiction. And as such I was very much looking forward to this latest novel, touted by the publisher As “a fast-moving plot and nail biting suspense” which it is suggested will keep the reader on tender hooks until its very end. Sadly this was not the case for me. I found the plot very contrived based upon unbelievable coincidences and chance happenings. Here is Ashleigh, a woman orphaned with no family trapped in marriage with a controlling and abusing husband. She finally decides to escape to make a new life for herself. She chances upon a copy of a magazine with a picture of an elderly couple in a remote country town, Blinman in the Flinders Ranges. Having nowhere else to go Ashleigh heads for this town prompted by an inexplicable attraction. She now has a new name Eliza and has changed her appearance – all to escape possible discovery by the brutal vengeful husband. In Blinman, Eliza finds an idyllic community which welcomes her and very quickly she becomes involved in the town. In this new life (what a surprise !) people start to notice her physical likeness to a woman who died tragically. There are lots of haunting moments where Eliza feels drawn emotionally to certain places. And of course we find that she is the abandoned daughter of a family in this very town. There are lots of side plots – animal smuggling out of the National Park, revelations about the criminal past of the abusive husband, and lots of heart warming country people ready to step in to assist. And of course Eliza finds love in the arms of Jacob, and all ends happily for her. Most of the action takes place in the small town of Blinman in the Flinders Ranges in the north of South Australia. There are delightful descriptions of the beauty of the landscape, and the warm and pleasant people of this country community, and the characters of the book are well drawn. All of which make the book a very pleasant read.